WASHINGTON, DC, December 6, 2010 (ENS) – California’s largest Indian tribe is seeking federal legislation that would transfer portions of Redwood National Park, Six Rivers National Forest and marine sanctuary waters off northern California to be managed as a tribal park, according to documents released by Public Employees for Environmental Responsibility, PEER. 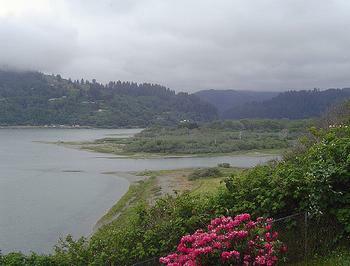 The lands at issue lie along the West coast where the Klamath River meets the Pacific Ocean. Draft legislation sent to the National Park Service by a lobbyist for the Yurok Tribe would award the tribe title to and/or management authority over thousands of acres of federal lands. The lands include 1,200 acres of Redwood National Park; 1,400 acres of the Six Rivers National Forest, now set aside as an old growth preserve; and Redding Rock, a sea stack five miles offshore, together with joint management of surrounding federal marine sanctuary waters. The bill also would appropriate $50 million in federal funds to purchase nearby private lands for the Yurok Tribe. The tribe’s lobbyist and point person for the deal is T. Destry Jarvis, a Clinton-era Interior Department appointee and older brother of current National Park Service Director Jonathan Jarvis. T. Destry Jarvis acknowledged that the draft bill goes beyond previous land transfers of park lands to tribes and will require “signoff from higher levels of NPS and DOI,” according to the May 21 email. Established in 1968, expanded in 1978, Redwood National Park now encompasses 75,452 acres, protecting some of the tallest trees on Earth, including 19,640 acres of old growth forest. “This gambit is one of a growing number of tribal overtures entangling national parks,” said Ruch. In August, PEER filed a complaint about park managers acceding to Indian requests to remove plants and cultural artifacts in violation of NPS regulations with the approval of NPS Director Jonathan Jarvis and strong support of the National Association of Tribal Historic Preservation Officers, which is also represented by T. Destry Jarvis.